As it turns out, just hours before Hope came into this world her body was drained of blood. How much blood loss? 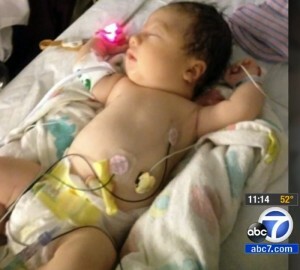 According to the doctors at Kaiser Permanente, Irvine Medical Center, around 80% of the baby’s blood was gone. After the emergency C-section, the only way for baby Hope to survive would be with a blood transfusion. That is exactly what she received and now the 6-week-old is doing fine. What went wrong? 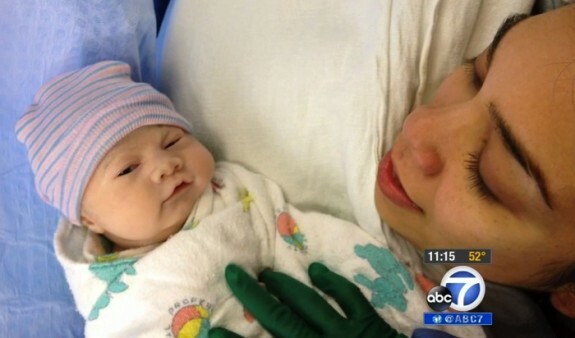 As Jennifer’s baby grew, she was active as all babies are. “She would kick around 10 times within half an hour, which is a lot,” said Jennifer to ABC News. However, three weeks before the official due date, all that kicking stopped. Jennifer called her midwife immediately. “She asked me, ‘Well what’s your gut feeling?’ And I said, ‘I don’t know. I just feel like something’s off. Something’s not right,'” said the 27-year-old Jennifer. Jennifer’s instincts were spot on. A fetal-maternal hemorrhage had occurred. The result is a rapid loss of blood. Even though there is slight fetal blood loss in 98% of pregnancies, a severe case can lead to dire consequences. The most recent example of a “ghost white baby” being born and survived occurred in England in 2012. 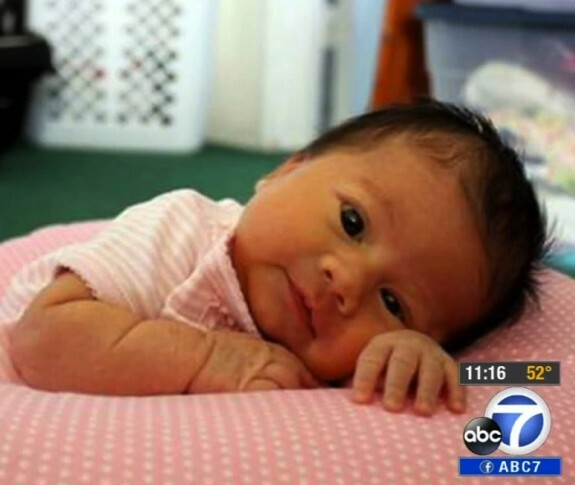 The symptoms were the same: Mom noticed the baby had stopped moving and sought medical attention immediately. Dr. Marielle Nguyen, a neonatologist at Kasier. She went on to tell ABC News that why Hope lost all her blood remains a mystery. The same can be said for how to prevent a fetal-maternal hemorrhage. It’s one of those rare occurrences that just happen. The huge takeaway here is that Jennifer’s actions saved her baby’s life. According to the doctors, even a few hours of waiting could have meant Hope wouldn’t have survived. “Go into the doctor. Get checked. Your baby’s life may depend on it,” Jennifer said. Lessons we should all embrace. ‘Re: ghost baby. Our grandson was also born with this condition. He was born Sept 2011. My daughter in law would love to contact Jennifer. Can anyone help poo?